This cake has all the flavors of Fall. 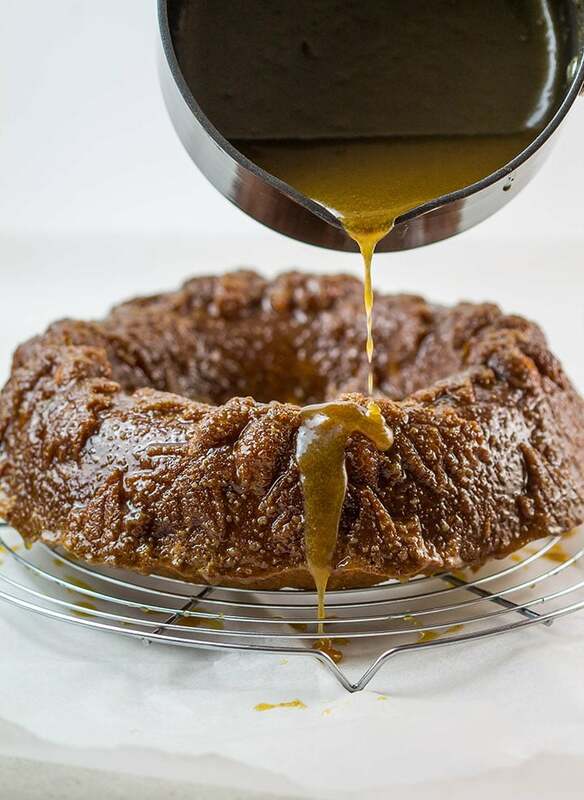 Moist spiced apple cake topped with a sticky, caramel glaze. It's pure bliss! 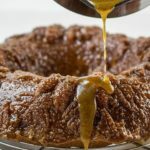 Indulge yourself with this recipe for Caramel Apple Bundt Cake – moist, delicious cake packed with apples & covered in a caramel glaze. Fall is upon us. So it’s official – we can start getting those pumpkin spice lattes, check out the TV shows in the new fall season, and cheering on our favorite football teams! And of course, baking our favorite apple recipes! Apples and caramel are a heavenly duo and this time of year, I love experimenting with the flavors. I have to say that my heart beats a little faster when I talk about this cake. 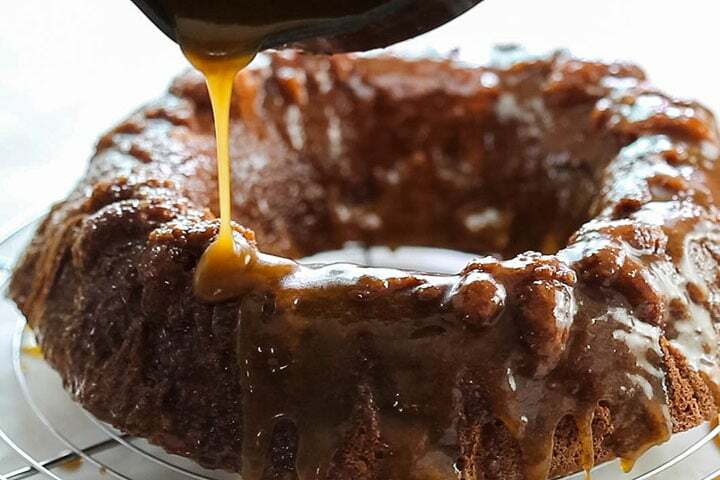 The tender, spiced apple cake and the thick, caramel glaze that marries the two together – What could be better? The cake is full of spiced apple flavor which pairs perfectly with the caramel glaze. The cake is super easy to make – all you need is a bowl and wooden spoon. The rich, buttery caramel glaze has just enough sweetness and doesn’t overpower flavors in the cake. Cakes that include the addition of fruit tend to be wonderfully moist and delicious, and this Caramel Apple Cake recipe definitely fits the bill! 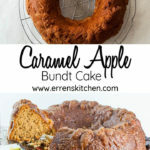 Combining apples and caramel not only creates an amazing flavor, but this cake comes out so incredibly tender and moist. Many recipes use artificial flavors or jarred applesauce for flavoring cakes. 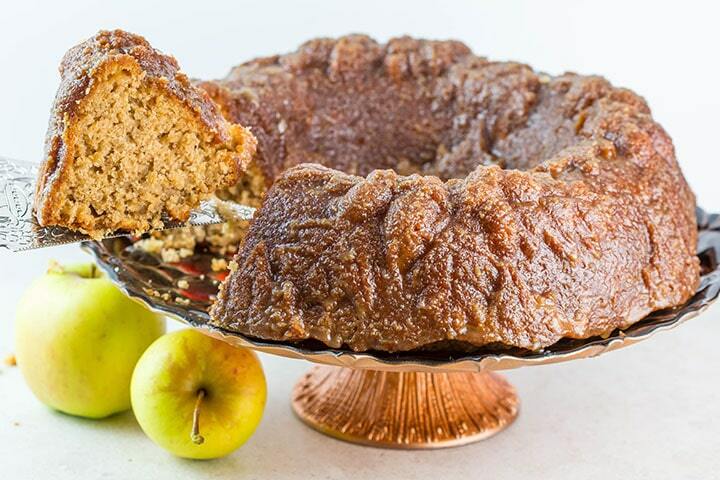 This apple cake recipe is made with fresh apples for the perfect flavor! You can use any type of apple you want; however, I find that Granny Smith apples are my favorite as they tend to hold up best. I use fresh grated nutmeg and cinnamon to spice this up a little. And let’s face it – what better combination is there when you want comfort food this time of year? Other Apple Recipes You’ll Love? The caramel glaze is insanely delicious. I’ve uses it for my Brown Sugar Cake and my Sticky Toffee Ginger Cakes. It’s so good I’m sure I’ll be making it in many more recipes to come. The key to the glaze is allowing it to cool enough to thicken, but still, be pouring consistency. See the tips section at the bottom of the post for more details. The best part about this recipe is how easy it is to prepare. The batter only needs a mixing bowl and a wooden spoon. No special equipment is required! 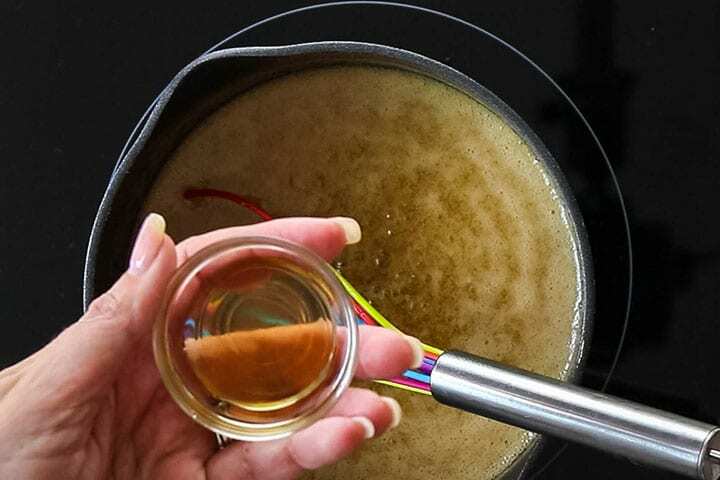 The caramel glaze doesn’t need a candy thermometer or special skills you just throw everything together in the pot and cook until it melts together and thickens. It’s that simple! 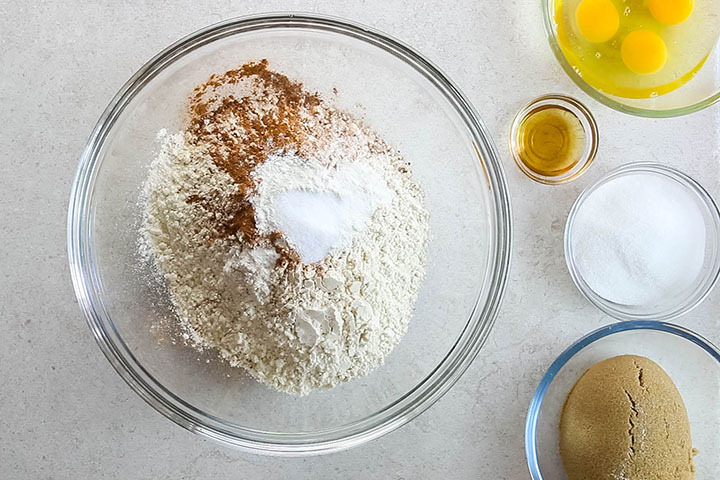 In a large mixing bowl mix the flour, cinnamon, nutmeg, baking powder, salt, and baking soda. Next, add the brown sugar, granulated sugar, eggs, and vanilla. Melted butter is added next. Mix to combine. 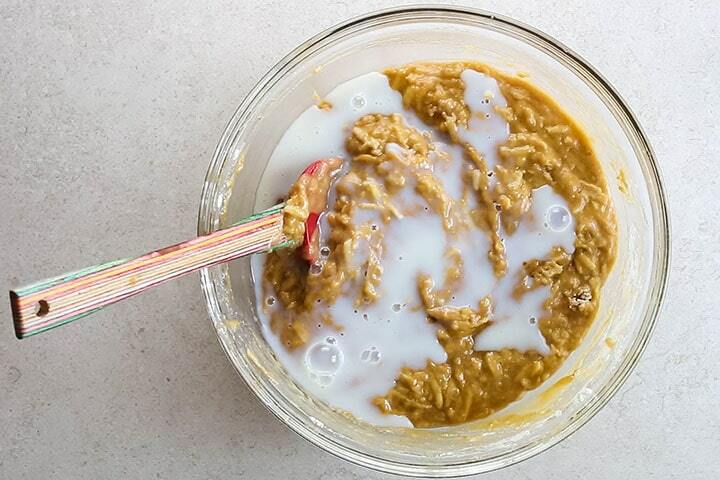 If the mixture is too thick, you can loosen it with some milk. Add the batter evenly to a well-greased pan. Bake and allow to cool. 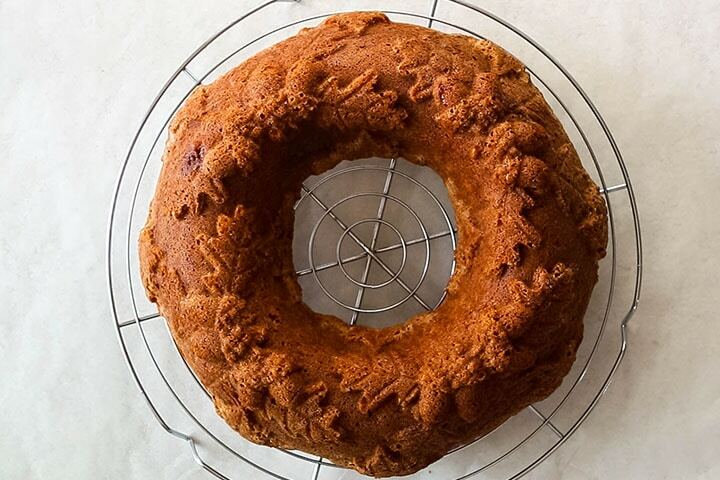 To get the beautiful pattern, I used a Nordic Ware Autumn Wreath Bundt Pan. If you’re in the US, you can get one from here on Amazon. If you’re in the UK, click here. 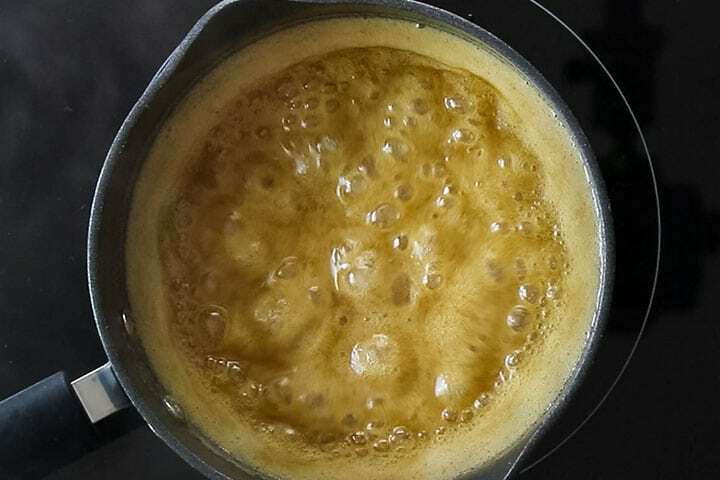 To prepare the caramel glaze, combine the butter, brown sugar, and milk in a medium saucepan. If you feel like it needs more or the glaze was thin, you can add another layer of caramel. After shredding the apples, coat them with a bit of citrus juice to keep them from turning brown before using. Lemon works best. Don’t have citrus juice? No problem. The batter is quite dark so brown apples won’t matter and it doesn’t affect the taste. If you like more significant chunks of apple, feel free to chop them instead of shredding. 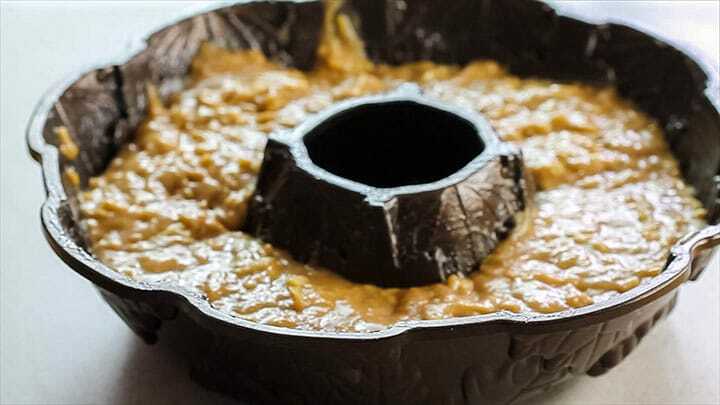 When making Bundt cakes, grease the pan generously to make it easier to remove the cake from the pan. Because this cake is so moist, you may have trouble with it sticking to the pan. I find the best solution is to use Wilton’s Cake Release – it will slide out of the pan perfectly. The longer The Caramel Glaze cools, the thicker it becomes. If you accidentally allow it to cool too much, heat it again (until fluid) and start over. When glazing the cake, place the cake on a cooling rack with baking paper under it to catch any glaze that drips from the cake. You can scrape it off the paper and glaze again. Refrigerating a cake causes it to dry out. It’s best to store at room temperature. You can cover a cake in a cake stand with a dome, for as long as 3 to 4 days. Typically, these coverings do not create an airtight seal, but they do prevent household dust or pet hair from sticking to your the cake. Alternatively, it can be stored in a cake tin or a sealed plastic container. Can Apple Cake be frozen? This Apple Cake can be frozen in an airtight container for up to four months. I suggest freezing without the glazed, but it can be frozen glazed too. How many slices do you get in a Bundt Cake? A 12-cup capacity Bundt Cake (that measures about 10 inches in diameter) makes 12-16 slices. For a salted caramel glaze– Add a teaspoon of salt to the glaze. For a Caramel Pear Cake – swap out the apples for pears. 5 medium apples grated - keep from turning brown with a little lemon juice squeezed on the slices. 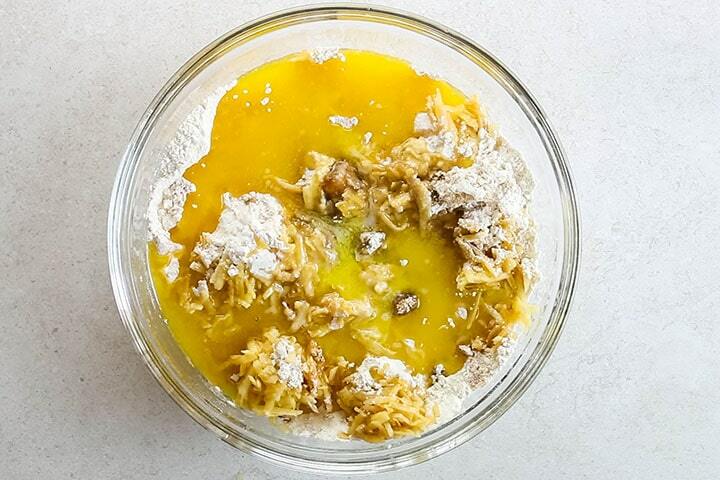 In a small bowl, melt the butter in the microwave, and let cool. In a large mixing bowl mix together the flour, cinnamon, nutmeg, baking powder, salt, baking soda, brown sugar and granulated sugar. 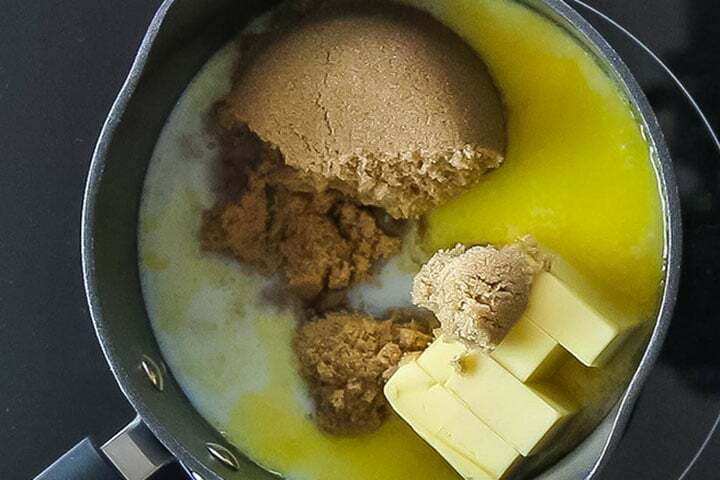 Add the cooled butter, eggs, and vanilla. Mix until smooth. 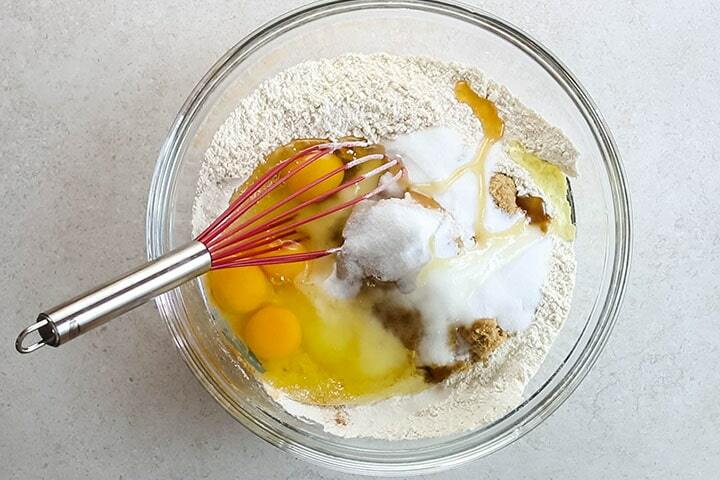 The batter should be easily stirred. If too thick, mix in the milk. Fold in the apples and spoon the batter into the bundt pan. Bake 50-60 minutes until a tester inserted into the center of the cake comes out clean. Cool in the pan for about 10 minutes, While the cake is cooling in the pan, mix together the apple and 1 cup of sugar to make the glaze. After the cake cools in the pan for 10 minutes, invert onto a cooling rack to cool completely. Reduce the heat and simmer to thicken for 1-2 minutes. Off the heat, stir in the vanilla and set aside to cool. The longer it cools, the thicker it becomes. 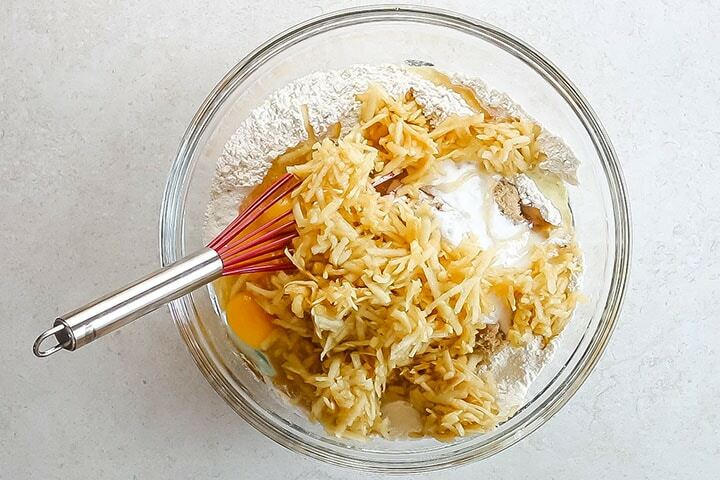 When it's at your desired consistency, drizzle over the cooled cake and serve. Don't have citrus juice? No problem. The batter is quite dark so brown apples won't matter and it doesn't affect the taste. The longer The Caramel Glaze cools, the thicker it becomes. If you accidentally allow it to cool too much, heat it up again (until fluid) and start over. This looks like the perfect dessert! I have to give it a try! You must, It is so easy too! Caramel and apples are two of my favorite sweet treats! Can’t go wrong with this cake; sounds decadent! Beth, I love your feedback! I could eat that glaze with a spoon! Ha! Such a delicious cake. Thanks for sharing! I love love love this cake!! 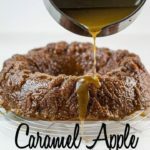 So moist, and I love apple – the caramel topping is SO GOOD!! It bakes well and is always done through for me. Five stars for certain!! Thank you Chrissie, Your feedback was awesome to hear!! Can’t you give the ingredients in grams so it would be easy to know how much to use. Hi Annie, In the recipe under the ingredients list, click metric and you’ll see it in grams. Made this for Thanksgiving. It was delicious! Thanks for the recipe! I’m so glad to hear it, Tina! 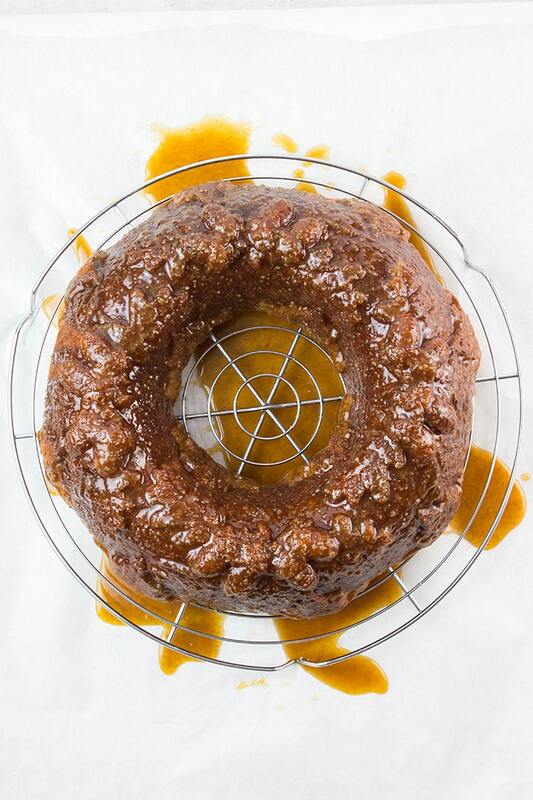 A nudge meant to be gentle — recipe says to grease a 2-cup capacity Bundt Cake. That made me smile. I will ignore that advice and use the larger pan I have. Hi Kathie, I can see why it made you chuckle! Good instincts on ignoring it LOL Thanks for the gentle nudge! Hi Erren, thank you for inviting me to be a recipe tester for this cake! 😊 It was absolutely fantastic! Everyone loved it!